Hello everyone, Jess here, wishing you a Merry Christmas, Happy Hanukkah, or whatever seasonal holidays may speak to you today! Whether one celebrates with family, friends or both, one universal thing that brings us together during these special times is food! Here’s what you’ll need to make the entire brunch, most of which you can grab directly from the farm stand or your chest freezer. Cider or Wassail are great beverages to accompany this breakfast, and a fruit salad helps to balance all of the richness. (I usually leave that part to the folks that want to bring something to the brunch). 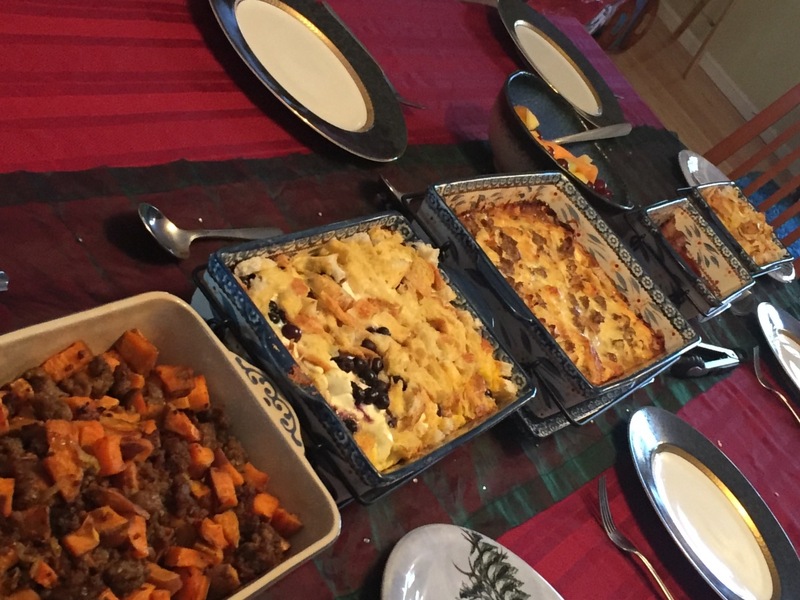 Set the table, placing out trivets and serving spoons to accompany your casserole dishes. Toast 6 slices of bread and lay out the other 10 slices to dry out for a bit as needed. Preheat your oven to 400 and lay your bacon onto a rimmed cookie sheet covered in parchment paper. Place into the oven and turn occasionally until the desired crispness is achieved. Carefully flip bacon after about 10 minutes and drain off excess fat as desired. 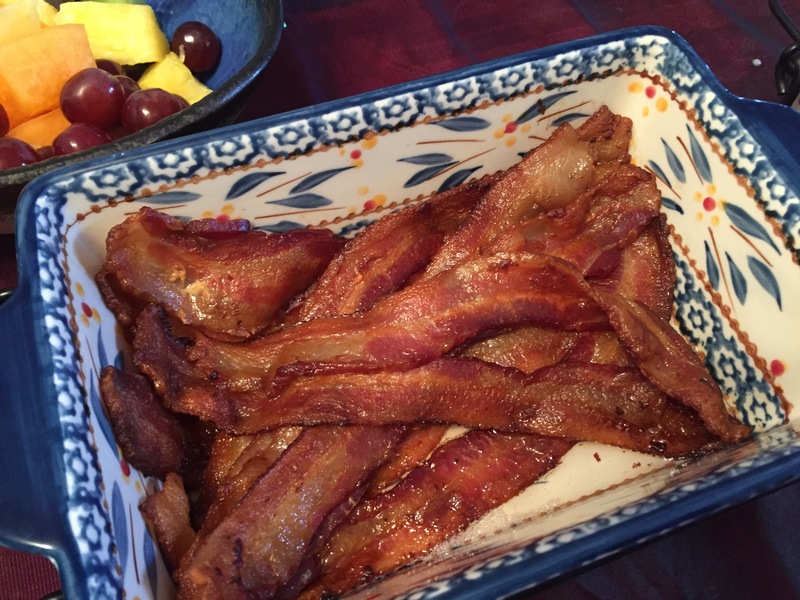 Once your bacon is done, drain it on paper towels and place in a parchment lined and oven safe serving dish (I use a loaf pan sized dish and layer the bacon). Cover and refrigerate. 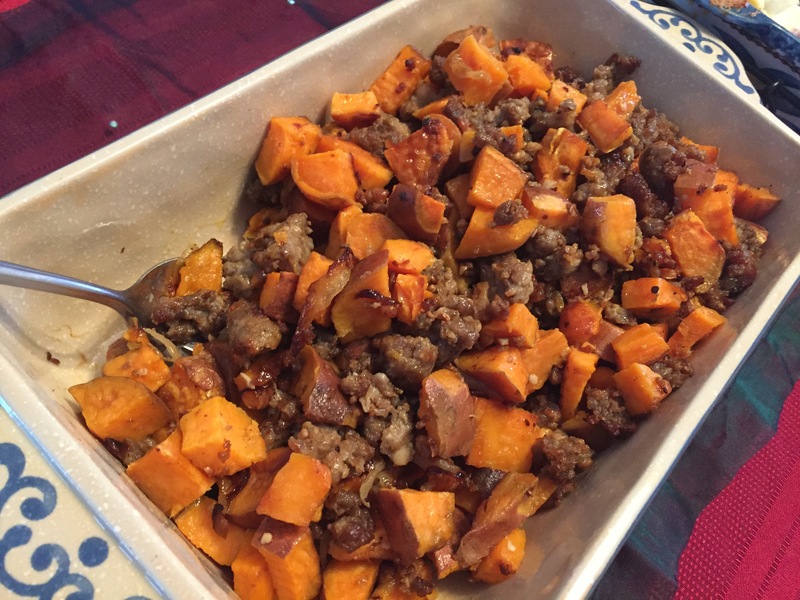 Bring the oven temp up to 425 for your Sweet Potato Hash. Prepare your Sweet Potato Hash as directed using half of your browned sausage (1 pound, the other half will be going into your Sausage Casserole). (You do cook this dish start to finish, but you’ll have time to move onto the other dishes while this one is sizzling in the oven). Place the completed hash into a casserole dish (I used another 9X11 casserole dish because that’s what I had on-hand, but really, whatever it fits into for reheating tomorrow will work.) Cool before covering and refrigerating. Prepare your Sausage Casserole as directed (right up until the part where it goes in the fridge) then cover with foil and refrigerate. 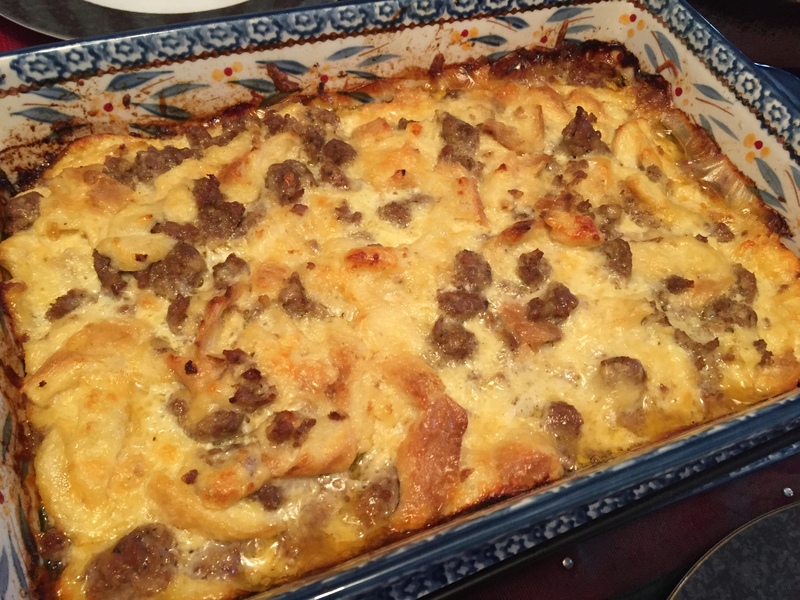 I recommend using a 9X11 casserole dish rather than a 10X13 as you won’t be reducing the temp to 325 as directed, so it can afford to be a little thicker. I use a little extra cornstarch because I work with frozen local blueberries instead of fresh. It helps to thicken things a bit more. 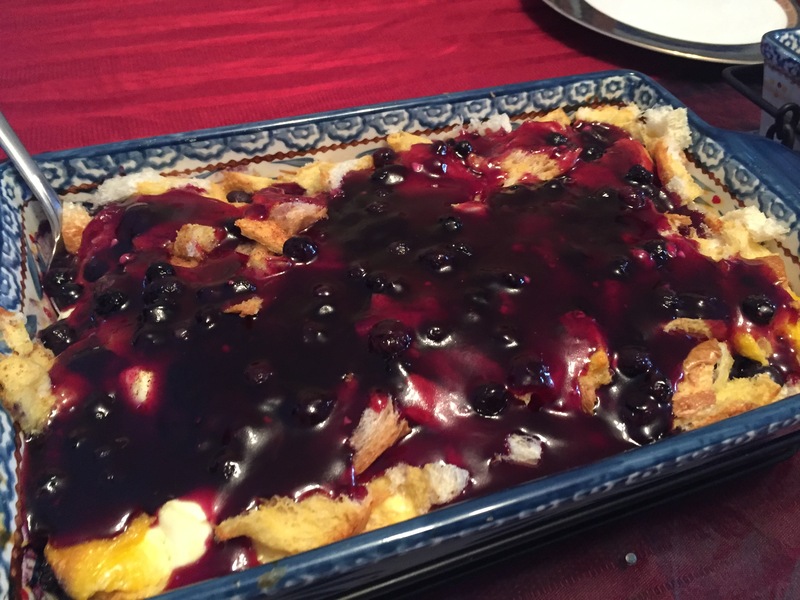 I sprinkle cinnamon on the finished casserole, and in the blueberry sauce. I also use a bit of lemon juice in the sauce as well. You’re all set, get a good night’s sleep and dream of sugar plums. 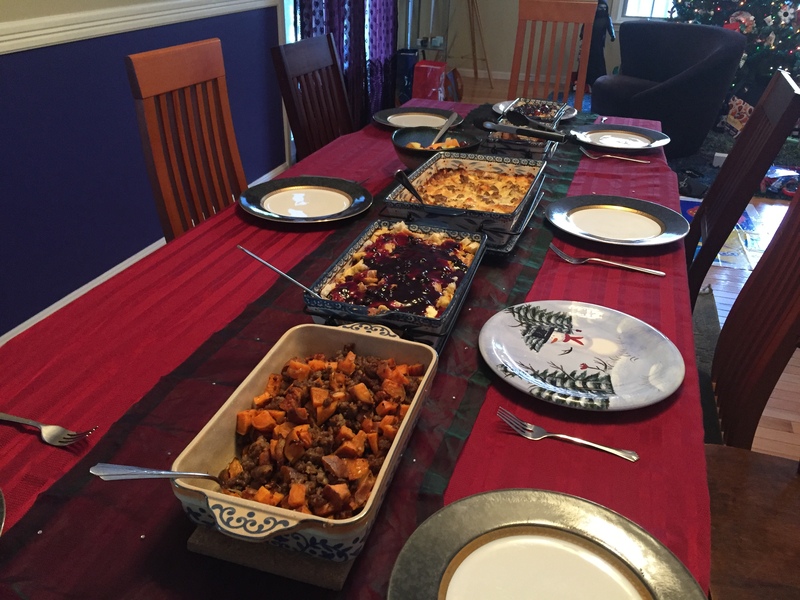 Remove everything from the oven, carefully placing on trivets with their serving spoons. Call your company to the table, then sit and enjoy!